This property sold for $218,000 12 months ago. BACK ON THE MARKET!! BEAUTIFULLY UPDATED 3/2 SPLIT LEVEL with GARAGE AND COVERED CARPORT IN FAMILY FRIENDLY NEIGHBORHOOD!! OVER 1500 SF UNDER AIR... LIVING ROOM..DINING AREA..AND DEN ARE ON TILED FIRST FLOOR AND BEDROOMS ARE ON 2ND LEVEL, WITH ORIGINAL WOOD FLOORS! !! COMPLETELY FENCED YARD, UPDATED KITCHEN w/GRANITE COUNTERTOPS AND REMODELED BATHROOMS. ELECTRICAL, PLUMBING, GARAGE DOOR, WATERLINE AND A/C WERE ALL REPLACED and/or UPDATED 5YRS AGO....INCL A NEW ROOF! HURRICANE IMPACT WINDOWS THROUGHOUT HOME. FRESHLY PAINTED EXTERIOR AS WELL. PRICED TO SELL FAST... GREAT STARTER HOME FOR RIGHT BUYER! GOOGLE MAP. 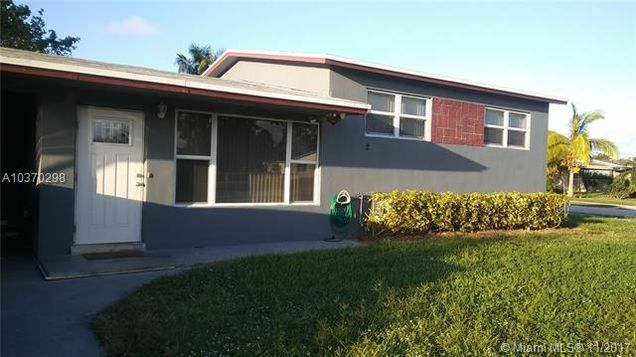 LOCATED NEAR NW 31ST AVE..BETWEEN NW 19TH ST AND OAKLAND PARK BLVD.